Dimensions: 6 3/8" x 9"
The book She by Amy Rowling addresses the challenges, fears, and concerns faced by many women. The writing, at once personal and universal, fictional and autobiographical, explores issues of self-worth, loss, grief, empowerment, and self-fulfillment. 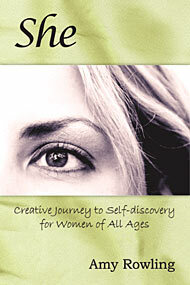 This book will serve as a supportive and creative inspiration for women of all ages, individually or in groups. Amy Rowling is a teacher, photographer, and writer living in Knoxville, Tennessee. She has a Master of Fine Arts degree, with a concentration in photography, and a Bachelor of Fine Arts, with art teaching certification. 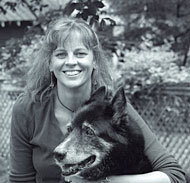 She spent twelve years living, teaching, and developing her creative talents in Cape Cod, Massachusetts. At present, she is the education and prevention coordinator of a sexual assault crisis center in Knoxville, developing and teaching prevention programs for children, adolescents, and adults throughout the community. She is also sharing this book, She, with groups of women as they work on their personal growth and self-actualization. The book She by Amy Rowling was recently published by Word Studio. This independent publishing company is owned and directed by Alicja Mann, a writer and photographer herself. Word Studio specializes in writing, designing, and publishing for the local community. It focuses on works that are of a reflective, personal, nature, and produces books that are artistically designed with high quality printing. Other publications by Word Studio include Son of Mashpee, The Onset Review, Undaunted Tales and Champagne Wishes. Word Studio is located in Tucson, Arizona and Falmouth, Massachusetts. ©2006 Word Studio. All rights reserved.